Bast is the patron of pleasure, protection, music, minstrels, bards, dance, and cats. In her true form, Bast is a lovely woman with the head of a lion or cat, often carrying an ankh or papyrus wand. She is always found in the company of a great many cats. 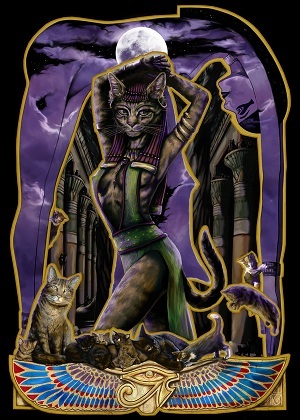 Bast is a goddess who delights in physical pleasures and yet maintains the quiet elegance of a feline. She is the daughter of Ra, and she, and her worshipers are the sworn enemies of Set and his minions, and will attack them on sight. She is the newest goddess of the Church of Light and Dark, worshiped mostly in the human kingdoms like the Western Empire, Eastern Territory, and Timiro Kingdom. She also has a growing following in the Yin Sloth Jungles. Her symbol is a cat. CrIsis sees Bast in Sinza, where she declares Minischmee king of Bizantium, along with Algor and Kym-nark-mar. Picture by the incredible Janice Duke. Go buy her art!